In this important book, the authors explore what answers mean in relation to how people understand the world around them and communicate with one another. They offer practical and theoretical insights that will prove invaluable when developing questionnaires. SEYMOUR SUDMAN is a Walter H. Stellner Distinguished Professor of Marketing and deputy director and research professor at the Survey Research Laboratory at the University of Illinois, Urbana-Champaign. He is the author, coauthor, or editor of seventeen books including Asking Questions (Jossey-Bass, 1982) which he wrote with Norman M. Bradburn. NORMAN M. BRADBURN is senior vice president for National Opinion Research. He is the Tiffany and Margaret Blake Distinguished Service professor in the department of psychology and the Harris Graduate School of Public Policy Studies at the University of Chicago. NORBERT SCHWARZ is professor of psychology at the University of Michigan, Ann Arbor, and a research scientist at the survey research center of Michigan's Institute for Social Research. With Seymour Sudman he wrote Context Effects in Social and Psychological Research (1992), Autobiographical Memory and the Validity of Retrospective Reports (1994). 2. 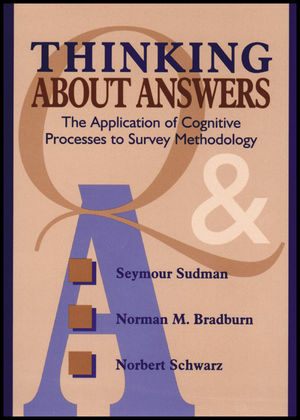 Methods for Determining Cognitive Processes and Questionnaire Problems. 3. Answering a Survey Question: Cognitive and Communicative Processes. 4. Psychological Sources of Context Effects in Survey Measurement. 5. The Direction of Context Effects: What Determines Assimilation or Contrast in Attitude Measurement. 6. Order Effects Within a Question: Presenting Categorical Response Alternatives. 11. Implications for Questionnaire Design and the Conceptualization of the Survey Interview.